At the heart of any desire to climb a mountain lies a certain aesthetic sensitivity: an attraction towards the beauty of these majestic structures, towards an unspoilt and potentially hostile environment, towards the harmony of sport and movement. Every climber has their preferences, some simple (shape, colour, shape and geology) and others more complex (geographic location, history). Even altitude is a determining factor in choosing a mountaineering goal: the height of a mountain, as well as being a geographic fact, also provides us with information on the size of the mountain compared to its neighbours, its characteristics and the physical commitment required for its ascent. When considering a massif or a mountain range, the highest peak will probably also encompass many of those assets which immediately attract a climber’s attention: the biggest face, the highest ridge, the largest glacier. The extreme nature of high altitude environments, enchanting on a sunny day and hellish in a storm, creates a certain fascination which, once experienced, is difficult to escape. In the alpine range, high altitude environments are usually found around 3000 metres upwards. 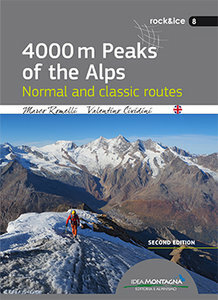 Only a limited number of peaks reach 4000 m, of which only a handful breach 4500, and only one, Mont Blanc, nears 5000 m. Despite their height being, in relative terms, half of that the Himalayan peaks, the four-thousanders are the genuine “Alpine Giants”: majestic and famous mountains which, above all, hold so much history.